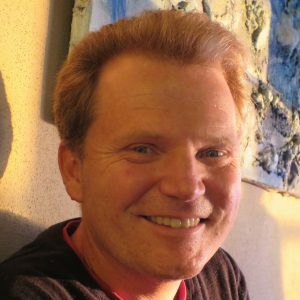 In 2009, Professor Tim Jackson catalysed a step-change in the conversation about the ‘growth imperative’ that is structurally built into our economic system. In a report for the UK Sustainable Development Commission, Jackson dared to name the elephant in the room by asking whether “prosperity without growth” was a possibility, stating clearly why ‘business as usual’ was no longer an option (Jackson, 2009a). 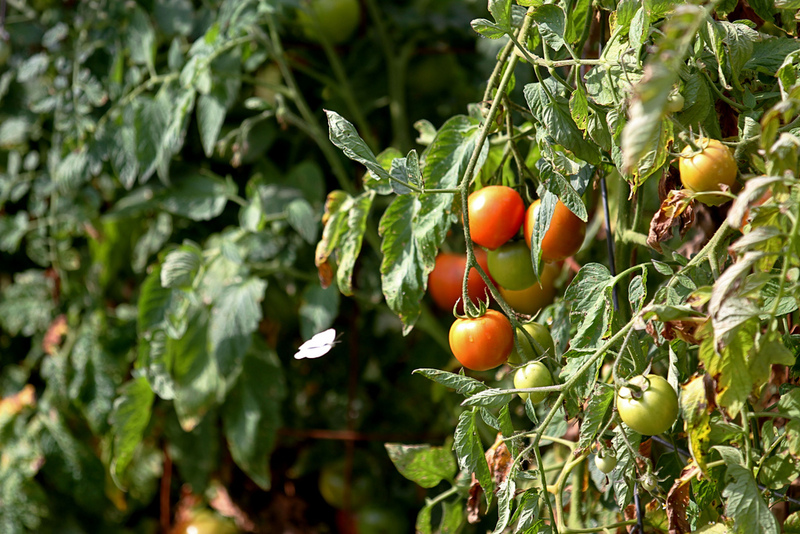 The report showed that while the global economy has more than doubled in size in the last 25 years, it has severely degraded more than 60% of the world’s ecosystems without delivering a more equitable sharing of wealth. To the contrary, inequality has grown both within and between nations. We live in a world with 5 billion poor and the bottom fifth of the world’s population have to make do with just 2% of global income. According to a Credit Suisse report, the richest 1% of people now own more than half of the world’s financial wealth (Treanor, 2014). This extreme inequality drives a series of devastating chain reactions, affecting health, community cohesion, national and international security, and the environment. Yet prosperity and wellbeing are not simply a function of the (financial) wealth a person has. We need more than money to feel well. Participation in thriving communities makes individuals prosper and through collaboration in community we can create prosperity for all. The report by Tim Jackson and Peter Victor on Green Economy at the Community Scale (2013) concluded that communities can take independent positive action to create a green local economy and improve prosperity for all. “At its best, green economy offers a positive blueprint for a new economics — one firmly anchored in principles of ecological constraint, social justice, and lasting prosperity” (p.6). Taking a systemic perspective on true prosperity means going beyond simply meeting material needs and giving equal importance to the establishment of social and psychological conditions in which individuals and communities can thrive. “Material bounds do not in themselves constrain prosperity; […] with appropriate attention to material limits, it may be possible to improve quality of life for everyone even as we reduce our combined impact on the environment” (pp.17–18). At the scale of local communities, abundance and human thriving are not exclusively based on the availability of material resources and energy but on human creativity and relationships. Community and individual prosperity depend on how we collaborate to create win-win-win solutions for all. Jackson and Victor identified four enablers of thriving communities: “the role of enterprise, the quality of work, the structure of investment, and the nature of the money economy” (p.6). Entrepreneurial and business activities in a community need to offer people the opportunity to flourish. Beyond providing the basic needs of food, clothing and shelter, “prosperity depends on ‘human services’ that improve the quality of our lives: health, social care, education, leisure, recreation, and the maintenance, renovation, and protection of physical and natural assets” (p.7). Almost all of us spend much of our lives working. In doing so we participate in important relationships that shape our culture. These relationships form part of the ‘glue’ of our society. “Good work offers respect, motivation, fulfilment, involvement in community and, in the best case a sense of meaning and purpose in life” (p.7). In the face of the multiple convergent crises that are challenging humanity, to participate in co- creating thriving local communities as expressions of a regenerative human culture can offer this sense of meaning and purpose in life. As previously mentioned, the restructuring of investment and the redesign of our monetary systems are two important enablers of such community-scale collaboration. Many inspiring and informative examples from around the world show how communities and regions can start to create economic structures that facilitate the emergence of regenerative cultures. The website Global Transition to a New Economy maps many of these initiatives. They all have a common thread: The path towards prosperity for all is co-created through collaboration. Regenerative systems are collaborative! The ‘solidarity economy’ approach illustrates this. SolidarityNYC, for example, tries to give visibility to, and create synergies between, existing initiatives that are part of community collaboration within New York City’s solidarity economy. The US Solidarity Economy Network supports this transformative impulse in the USA. Internationally, The Alliance for Responsible Plural and Solidarity Economy has stimulated dialogue on how we can co-create a collaborative economic model that builds rather than divides community in Asia and Brazil, and www.socioeco.org offers an excellent resource in this area. A UN Research Institute for Social Development report concluded: “Policy makers and the international development community at large need to pay far more attention to ways and means of enabling SEE [Social Solidarity Economy]. This is particularly apparent in the current context of heightened risk and vulnerability associated with economic and food crises and climate change” (UNRISD, 2014: v). 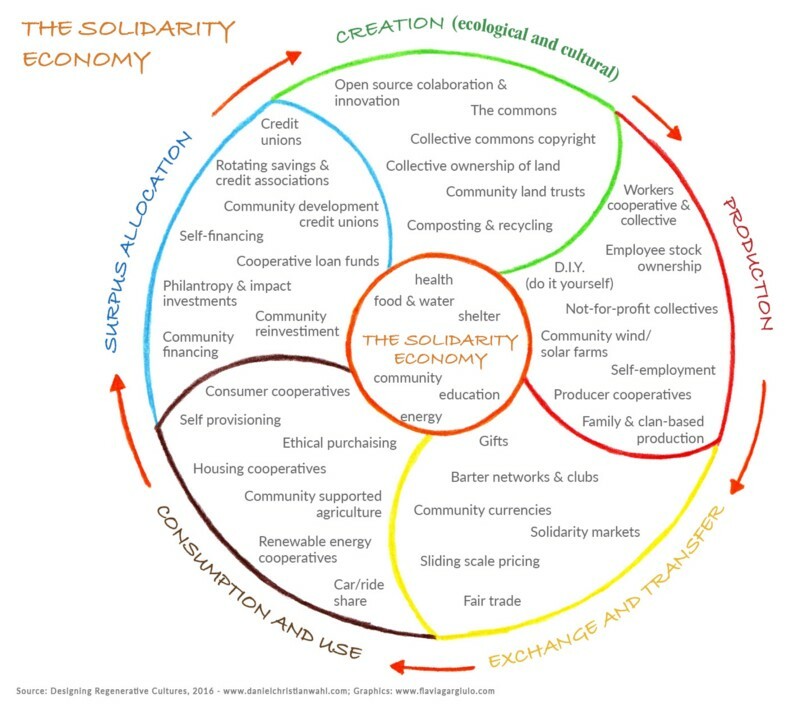 Ethan Miller (2010) has attempted to map the diverse economic strategies, organizational forms and tools that can contribute to the creation of a solidarity economy (Figure 25).